Admin time is a measurement recorded automatically by ServiceM8 against each job to try to track the 'hidden' time spent completing jobs by staff in your business. Everyone tracks labour for each job, but do you know how much time your accountant has spent? Your scheduler or receptionist? This is where admin time comes in - imagine knowing how much time was really spent on a job, regardless of how much labour you charged. Admin time allows you to make final adjustments to job pricing before invoicing, or to get a better understanding of the actual time involved in jobs for the next one. How is admin time tracked? ServiceM8 uses a custom algorithm to monitor the amount of time your admin, or web users, spend on each job. From the moment you open a job on the dispatch board, the time is being recorded against that job. Admin time doesn't require any additional work from you - without thinking about it, you will open the job while you make client phone calls, produce quotes and emails, or you are just focused on that job. ServiceM8 even monitors your mouse, so if you go and grab a coffee the admin time will pause until you return. This is a great red flag when doing your invoices to identify jobs that required additional hidden manpower to complete (maybe they asked for quote changes, or had custom requirements). Where can I find the admin time recorded for a particular job? 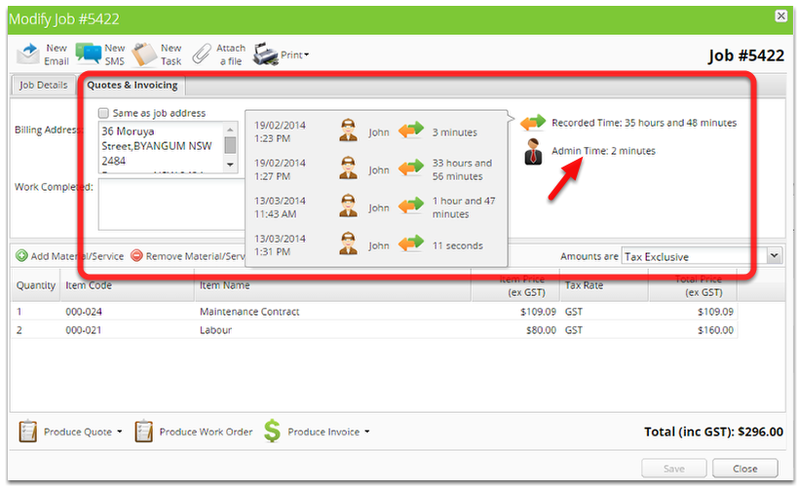 Admin time appears on the Quotes and Invoicing tab when you open any job. Clicking on the total Admin Time will break it down into which staff member and on what days was the time spent.